eGenix PyRun™ combines a Python interpreter with an almost complete Python standard library into a single easy-to-use executable. 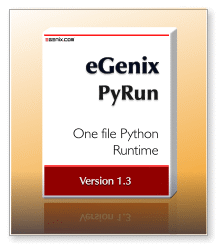 eGenix PyRun™ is our one file, no installation version of Python, making the distribution of a Python interpreter to run based scripts and applications to Unix based systems as simple as copying a single file. eGenix PyRun's executable only needs 11MB, but still supports most Python application and scripts - and it can be further compressed to 3-4MB using upx, if needed. Compared to a regular Python installation of typically 100MB on disk, eGenix PyRun is ideal for applications and scripts that need to be distributed to several target machines, client installations or customers. It makes "installing" Python on a Unix based system as simple as copying a single file. eGenix has been using the product internally in the mxODBC Connect Server since 2008 with great success and decided to make it available as a stand-alone open-source product. We provide both the source archive to build your own eGenix PyRun, as well as pre-compiled binaries for Linux, FreeBSD and Mac OS X, as 32- and 64-bit versions. The binaries can be downloaded manually below, or you can let our automatic install script install-pyrun take care of the installation: ./install-pyrun dir and you're done. Small footprint: only about 11 MB in size. Can be compressed to just 3-4 MB using upx. Full Python Support: PyRun works with Python 2.5, 2.6 and 2.7. Cross Platform Support: PyRun runs on the following platforms: Linux, FreeBSD and Mac OS X. Full 64-bit Support: PyRun can be built on both 32-bit and 64-bit builds on all supported platforms. Highly Portable Codebase: in addition to the already supported platforms for PyRun, we provide custom porting services for more exotic platforms. Easy Installation: Simply drop the executable into a directory and start using it. No installers, no packagers and only a minimal set of dependencies needs to be provided. Fully Relocatable: eGenix PyRun uses relative search paths, so you can easily move the installation around. Compatible with setuptools/distribute, easy_install, pip: Great care was taken to make sure that PyRun can be used with setuptools et al. Please note that these tools are not designed to be relocatable. Perfect virtualenv replacement: PyRun provides an even better level of isolation from the system installed Python version. Instead of using symlinks and other tricks to create a virtual Python environments, PyRun comes with a complete Python runtime and thus doesn't need to play any tricks. Commerical Support: eGenix provides commercial support for PyRun, in case you need custom builds, help with the integration or need problem solving support. Future versions of PyRun will add more flexibility to the build process to make the requirements more customizable. If you want to compile PyRun yourself, you will need the development packages of the above tools, a C compiler and a GNU make compatible make installed. Please note that the binary versions of these libraries also need to be available on the PyRun installation target systems. Most modern Unix systems have the above libraries installed per default. Please see the eGenix PyRun User Manual for setup instructions. eGenix PyRun is covered by the eGenix.com Public License Agreement 1.1.0 which is an Open Source license based on the CNRI Python license. Since PyRun also pulls in Python, the respective Python license also applies to the resulting pyrun binary. See the eGenix PyRun license page for more details. In simple words, you are free to use the software without paying fees or royalties as long as you give proper attribution and keep the license documents together with the software. Please see the license document for details and consult a lawyer if you have legal questions. The manual includes a usage guide, an explanation of the build procedure and discusses a few common use cases. The PDF file is also available as part of the installation and can be found in the PyRun/Doc/ folder. Please note that the documentation for this release is not yet as complete and comprehensive as it should be. We're working on it. For details on how to use Python via eGenix PyRun, please refer to the official Python documentation. You can use any of the available Python books to learn to use Python with PyRun. We provide pre-compiled binaries of PyRun for a number of platforms, and also make the sources available, so you can build your own variants. By downloading, installing or using eGenix PyRun, you agree to the terms and conditions set forth in the eGenix.com Public License Agreement 1.1.0 which is an Open Source license based on the CNRI Python license and the Python license. See the eGenix PyRun license page for more details. You'll always get the latest version of PyRun, distribute and pip that way. See the virtualenv replacement section below for more details. After download of the script, your have to make it executable using chmod 755 install-pyrun and move it to a bin/ directory on your PATH. In its simplest form, run ./install-pyrun test. This will install egenix-pyrun, setuptools and pip under the directory test/. The script will provide help when invoked with ./install-pyrun -h. More detailed instructions are available in the documentation. eGenix PyRun currently does not support Windows. We are working on a port, but this is not a high priority at the moment. Patches are welcome ! For instructions on how to install these binary distributions, please see the installation section below. Solaris binaries can be made available on demand. AIX binaries can be made available on demand. For instructions on how to install from source code, please see the installation section below. If you need binaries for platforms not mentioned here, please contact support@egenix.com for details. It is very likely that we can find a way to help you. Python can be built as narrow Unicode version (UCS2) or wide Unicode version (UCS4). If you get errors such as "unresolved symbol PyUnicodeUCS2_AsEncodedString" when trying to load an extension from eGenix PyRun, you have likely installed a binary for different Unicode version. eGenix PyRun currently does not support Windows platforms. Simply download a suitable binary distribution for the version of Python and platform you need and extract it to a base directory where you'd like PyRun to live. Then use the eGenix PyRun executable like you'd use a regular Python interpreter, e.g. You can also put pyrun into the shebang of the script, e.g. Please note that the binary distributions contain more than just the PyRun executable. They also come with a few extra standard library extensions which are normally not part of PyRun and the include files needed to compile Python extensions for use with PyRun. If you are just looking for the plain single-file PyRun executable, only extract the file bin/pyrunX.X (with X.X being the underlying Python version, e.g. 2.7) from the binary distributions. To further simplify installation of eGenix PyRun, we've created a bash script which you can use to easily install PyRun in a similar way to how you'd use the virtualenv script. The script is called install-pyrun and available from our download server. The script will download the right PyRun binary distribution for your platform, install it in the targetdir and then download and install distribute and pip. It uses curl to download the packages, so you need to have curl installed on your platform. The lib/pythonX.X directory is used as location of the Python libaries and automatically put on sys.path in case it is available. Optional packages installed through distutils or setuptools will go into the corresponding lib/pythonX.X/site-packages/ directory. The lib/pythonX.X directory may also contain Python standard library extension modules in the lib-dynload/ sub-directory which are not integrated into the eGenix PyRun executable. The prebuilt binary distributions come with a set of such extensions. The include/pythonX.X directory is only needed in case you want to compile Python C extensions. It is available as part of the prebuilt binary distributions we make available. This will download the Python source distribution and start a build of eGenix PyRun. The result will be installed to the directory /usr/local/ using the directory layout as described above. You can then pick up the distribution archive from the dist/ directory. If you would rather install to a different directory, you can add the make parameter PREFIX=/path/to/pyrun/, This will cause make to install eGenix PyRun in /path/to/pyrun/. If you want to build against a specific Python version, you can specify the version using the make parameter PYTHONFULLVERSION=2.7.5. Please have a look at the PyRun/Makefile for more ways of customizing the setup. For future versions of eGenix PyRun, we plan to make the setup customizable via a top-level setup.py file so you can use Python to trigger the build, customize the included standard lib extension modules and installation. Professional level support for this product as well as all other eGenix products and Python itself is available directly from the developers at eGenix.com. eGenix.com offers professional consulting services for all questions and tasks around this product, including customized modifications, help with integration and on-site problem solving. Please contact sales@egenix.com for details. In order for our users to keep in touch and be able to help themselves, we have created the egenix-users user mailing list. eGenix PyRun has been in use in production as part of our mxODBC Connect Server client-server database product for many years. We are pleased to make it available to a wide public.